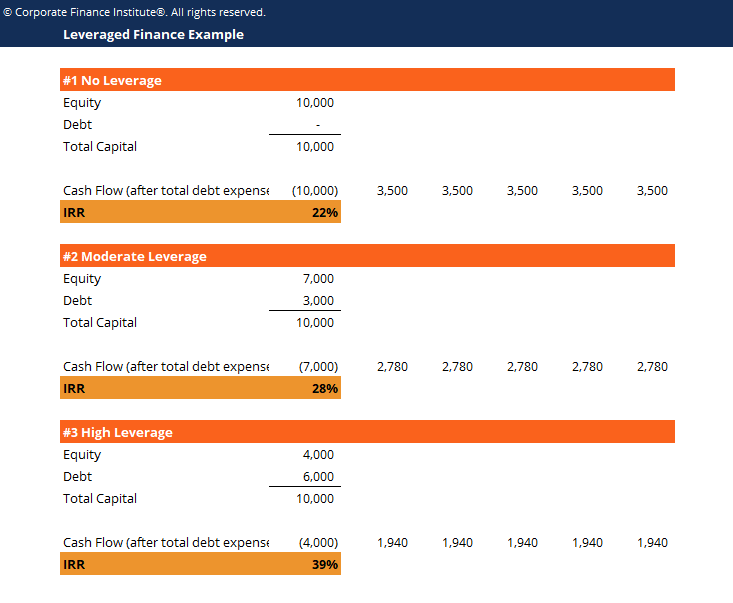 This leveraged finance template shows the calculation of internal rate of return of an investment with different levels of leverage. Leveraged finance is the use of an above-normal amount of debt, as opposed to equity or cash, to finance the purchase of investment assets. Leveraged finance is done with the goal of increasing an investment’s potential returns, assuming the investment increases in value. Private equityPrivate Equity Career ProfilePrivate equity analysts & associates perform similar work as in investment banking. The job includes financial modeling, valuation, long hours & high pay. Private equity (PE) is a common career progression for investment bankers (IB). Analysts in IB often dream of “graduating” to the buy side, firms and leveraged buyoutLeveraged Buyout (LBO)A leveraged buyout (LBO) is a transaction where a business is acquired using debt as the main source of consideration. An LBO transaction typically occur when a private equity (PE) firm borrows as much as they can from a variety of lenders (up to 70-80% of the purchase price) to achieve an internal rate return IRR >20% Firms will employ as much leverage as possible to enhance their investment’s internal rate of return or IRRInternal Rate of Return (IRR)The Internal Rate of Return (IRR) is the discount rate that sets the net present value of an investment equal to zero. This guide to calculating IRR will give several examples and who why it's used in capital budgeting, private equity and other areas of finance and investing. If IRR is greater than cost of capital,. The effective cost of debtCost of DebtThe cost of debt is the return that a company provides to its debtholders and creditors. Cost of debt is used in WACC calculations for valuation analysis. Learn the formula and methods to calculate cost of debt for a company based on yield to maturity, tax rates, credit ratings, interest rates, coupons, and is lower than equity (since debt holders are always paid out before equity holders, and hence it’s lower risk). Leverage, however, will also increase the volatility of a company’s earnings and cash flowCash FlowCash Flow (CF) is the increase or decrease in the amount of money a business, institution, or individual has. In finance, the term is used to describe the amount of cash (currency) that is generated or consumed in a given time period. There are many types of CF, as well as the risk of lending to or owning said company. These risks will include factors such as (but not limited to) changes in the company’s liquidity, the stability of its industry, and shifts in the economy such as interest rates.